Even though I make an arduous effort to hide it, I'm going to reveal it here: I'm going grey. And no, it's not a recent event. In fact, my first grey hair made an appearance when I was eleven. Soon after, the rest of the crew followed. At the moment, besides those scattered strands, I have a full-on Stacy London-esque grey section of hair, on the front. I thought that having blunt bangs would help to prolong the interval between colourings, and it did at first, but as the grey section expanded it's territory, it managed to conquer the top hairs in my fringe, becoming perfectly visible. Having dry hair and being sensitive to dyes — and yes, I do use products like INOA — the four-week period between camouflage jobs was short enough for my capillary health, so I was determined to find temporary solutions to continue to mask my secret until the next root touch-up. I found quite a number of solutions for this issue: sprays, powders, creams... Some perform better than others, but I didn't find the perfect formula just yet. When it comes to sprays/coloured dry shampoos and powders, they're not ideal unless you benefit from the matte effect they provide. In my case, they make my hair look dull and the coverage is way too sheer for my dark brunette mane. The creamy formulas that come in a tube form and usually carry a spooly or a doe foot applicator, provide a better finish compared to powders. The one I'm using at the moment is L'Action Cosmetique Bye Bye Grey Hair in Dark Brown. 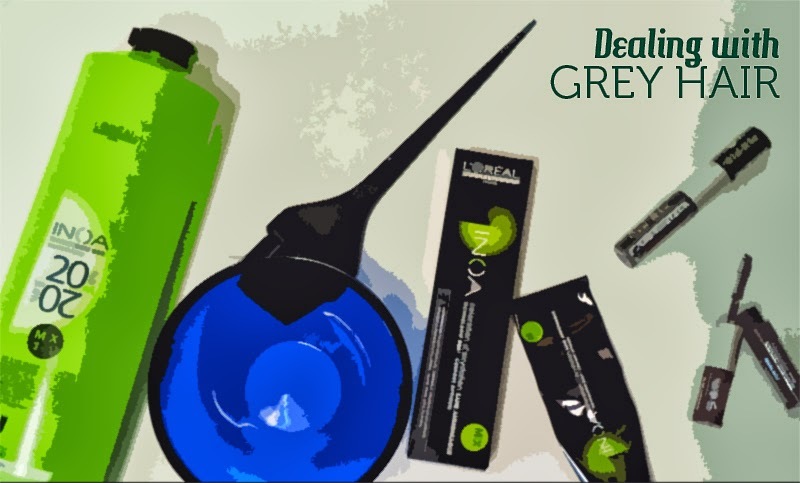 Apply it directly to grey roots and wait a few minutes to dry. I like to brush it carefully afterwards, so it looks more natural (less crispy). FYI, it only lasts until your next shower and not 3 to 10 days, as stated in the label. The coverage is medium to full, depending on the shade. I'm hoping to find a better formula in the the near future — I'll keep you posted. Until then, will continue to use this cover-up during the last couple of weeks that precede the next colouring.